Related Article: United Kingdom, Great Britain, British Isles - What's the Difference? Where is the United Kingdom? The United Kingdom is located in western Europe and consists of England, Scotland, Wales and Northern Ireland. It is bordered by the Atlantic Ocean, The North Sea, and the Irish Sea. Google Earth is a free program from Google that allows you to explore satellite images showing the cities and landscapes of United Kingdom and all of Europe in fantastic detail. It works on your desktop computer, tablet, or mobile phone. The images in many areas are detailed enough that you can see houses, vehicles and even people on a city street. Google Earth is free and easy-to-use. United Kingdom is one of nearly 200 countries illustrated on our Blue Ocean Laminated Map of the World. This map shows a combination of political and physical features. It includes country boundaries, major cities, major mountains in shaded relief, ocean depth in blue color gradient, along with many other features. This is a great map for students, schools, offices and anywhere that a nice map of the world is needed for education, display or decor. If you are interested in United Kingdom and the geography of Europe our large laminated map of Europe might be just what you need. It is a large political map of Europe that also shows many of the continent's physical features in color or shaded relief. Major lakes, rivers,cities, roads, country boundaries, coastlines and surrounding islands are all shown on the map. Aberdeen, Aberystwyth, Antrim, Armagh, Ayr, Ballycastle, Barnsley, Barrow-in-Furness, Bath, Belfast, Birmingham, Blackpool, Bournemouth, Bradford, Brighton, Bristol, Caernarfon, Cambridge, Canterbury, Cardiff, Carlisle, Carmarthen, Chelmsford, Cheltenham, Chester, Chichester, Coleraine, Cookstown, Coventry, Cupar, Derby, Doncaster, Dorchester, Dover, Downpatrick, Dumfries, Dundee, Durham, Edinburgh, Exeter, Falkirk, Fishguard, Fort William, Glasgow, Gloucester, Grimsby, Hamilton, Hastings, Hereford, Holyhead, Inverness, Ipswich, King's Lynn, Kingston upon Hull, Kirkcaldy, Kirkwall, Larne, Leeds, Leicester, Lerwick, Lewes, Lincoln, Liverpool, London, Londonderry, Luton, Maidstone, Manchester, Mansfield, Matlock, Middlesbrough, Mold, Motherwell, Newcastle upon Tyne, Newport, Newry, Newton Saint Boswells, Northallerton, Northampton, Norwich, Nottingham, Oban, Oxford, Penzance, Perth, Peterborough, Plymouth, Portsmouth, Preston, Reading, Reigate, Saint Andrews, Salisbury, Scarborough, Sheffield, Shrewsbury, South Shields, Southampton, Southend-on-Sea, Stafford, Stockport, Stoke-on-Trent, Stornoway, Stranraer, Stratford-upon-Avon, Stroud, Sunderland, Swansea, Thurso, Torbay, Trowbridge, Truro, Ullapool, Wakefield, Warwick, West Bromwich, Weymouth, Winchester, Wolverhampton, Wokingham, Workington, and York. Atlantic Ocean, Bristol Channel, Cardigan Bay, Celtic Sea, English Channel, Firth of Lorn, Hebrides Islands, Irish Sea, Isles of Scilly, Isle of Wight, Kilbrannan Sound, Loch Ericht, Loch Katrine, Loch Laggan, Loch Lomond, Loch Ness, Loch Rannoch, Loch Tommel, Lough Neagh, Lyme Bay, Morecambe Bay, North Channel, North Sea, Norwegian Sea, Orkney Islands, Saint George's Channel, Sea of the Hebrides, Severn River, Shetland Islands, Solway Firth, Strait of Dover, Thames River, The Minch, Trent River, Tweed River, and Wigtown Bay. The United Kingdom has fossil fuels of coal, petroleum and natural gas. Metal resources in the country include iron ore, lead, tin, zinc and gold. Numerous other natural resources present include salt, gypsum, potash, chalk, clay, silica sand, slate, limestone and arable land. The United Kingdom has some natural hazards, which include floods and winter windstorms. Although the United Kingdom has made progress in reducing greenhouse gas emissions, air pollution is still an issue. Pesticides and heavy metals have caused soil pollution. Industry, tourism, and housing pressures have caused the loss of some marine and coastal habitats. Copyright information: The images on this page were composed by Angela King and Brad Cole and are copyright by Geology.com © 2008. These images are not available for use beyond our websites. If you would like to share them with others please link to this page. 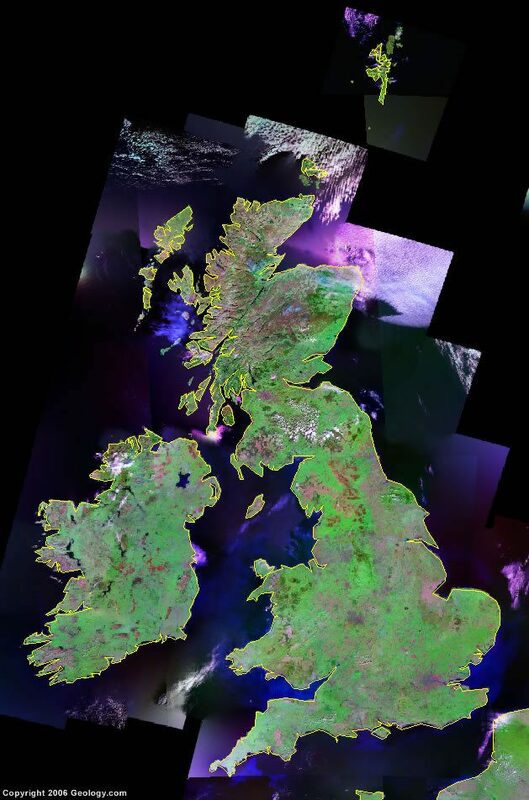 The satellite image was produced using Landsat data from NASA.